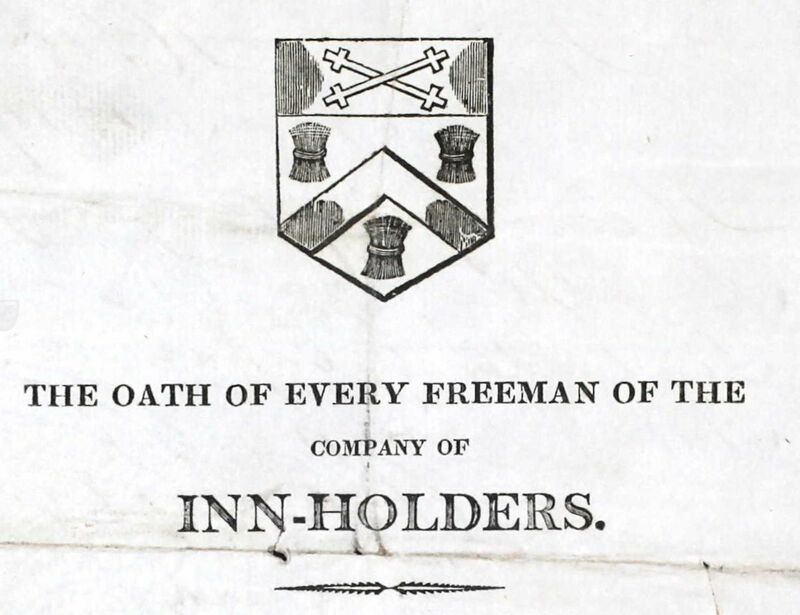 In 1826, William Shaw insured premises at 74 Blackfriars Road with the Sun Fire Office. His occupation is given as ironmonger, so that would match the information I had from Tallis, but the house number did not match, or did it? 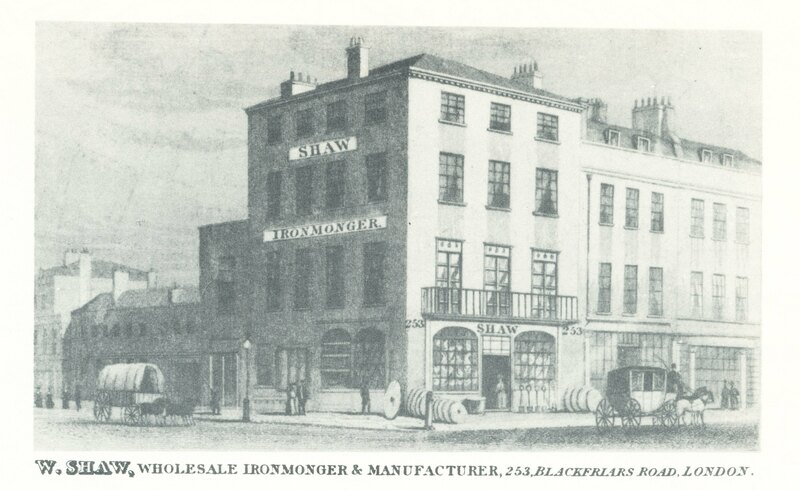 The policy register kindly informs us that the ironmonger’s business was situated on the corner of Holland Street and that does match the information in the Tallis Street View booklet. An 1829 insurance with the Sun Fire Office, and indeed many later ones, list Shaw’s business at number 174, so I assume that there was a transcription error in the 1827 registry, and the house number was in fact 174. In 1831, the numbering had not yet changed to 253, but the name of the street has changed and is now referred to as Great Surrey Street. The 1835 and 1836 insurance records were hedging their bets by naming it ‘Great Surrey Street Blackfriars’. According to The Survey of London “the road was known as Great Surrey Street until 1829 when its name was changed to Blackfriars Road.”(1) Well, not quite, but we get the picture. In 1836, the insurance records still number the house as 174, but Tallis has no. 253, so the numbering must have been altered somewhere around 1837 or 1838. In 1823, the stock of a tea dealer who had his business at number 174 Great Surrey Street came on the market, certainly suggesting that the owner had either gone bankrupt or died. 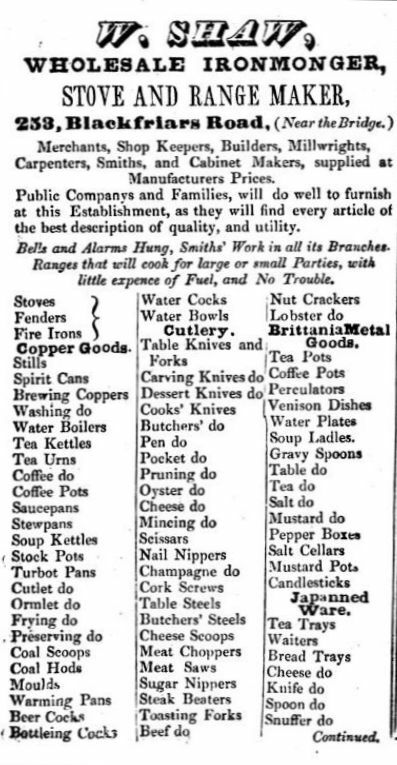 (2) Kent’s 1823 directory listed a Mr. Greenhill, grocer, on the premises, but whether Shaw took possession immediately after the tea dealer/grocer had left is not clear, as the earliest mention of him is 1826. 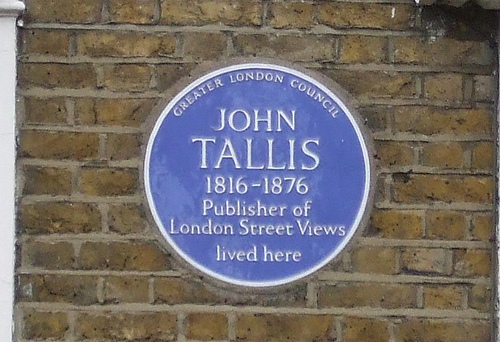 The property was fairly substantial as we can see from the vignette in Tallis’s Street View. The street on the left with the covered wagon is Holland Street and the one on the right with the carriage is Blackfriars Road. 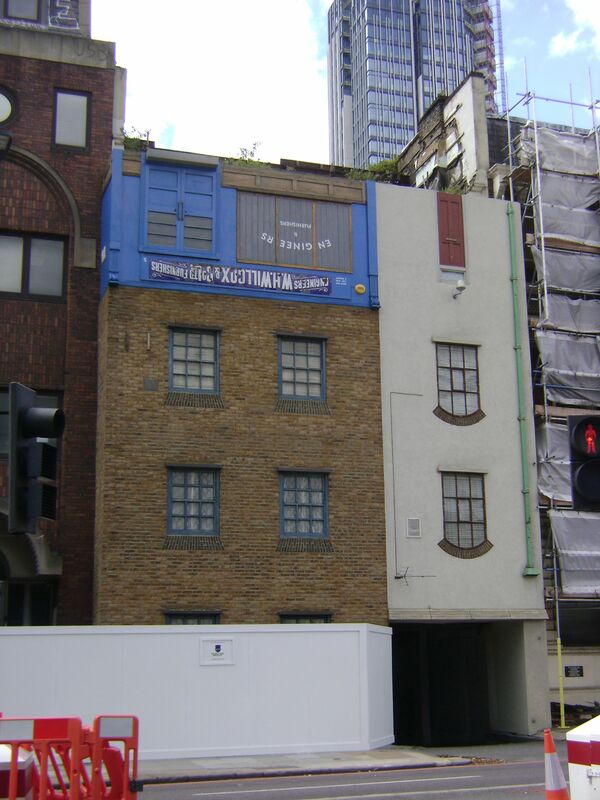 Despite the size of the building, not many people actually lived there; the 1841 census only lists Robert Shaw, 24 years old, an ironmonger; Eliza Shaw, 17 years old, no occupation given; Charles Stephenson, 18 years old, an apprentice; and Mary Cook, 24 years old, a servant. Whether and how Robert and Eliza are related is not made clear. Ten years later, we find Frederick F. Shaw, 26 years old, an unmarried ironmonger, at number 253 with his sister Mary A. Staff, a 36-year old widow; and Frederick Bates, 18 years old, a servant porter. Frederick Francis was most likely the son of William and Mary Shaw who was baptised on 24 December 1824 at Christchurch, Southwark, but not much else is known about the family. The numerous entries in the various records for people with the name Shaw do not make it easy to search for a particular individual with that name, and the combination with William certainly does not make it any easier, so we will concentrate on the business itself. The 1843, 1848 and 1851 Post Office Directories all list William Shaw senior as ironmonger at number 253. One William junior can be found at 39 Newington Causeway, but whether he was William senior’s son, or in any other way related is not yet clear. I will try to solve that puzzle when I get round to writing the post on 39 Newington Causeway. 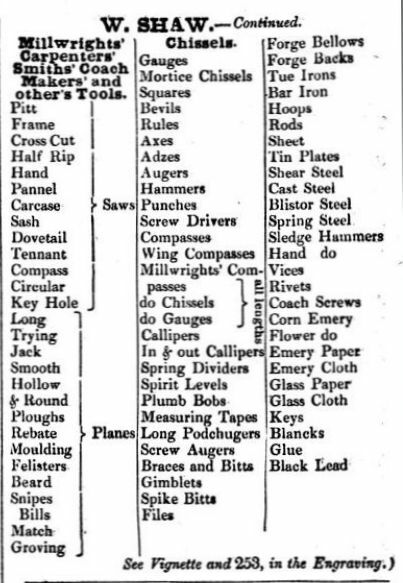 The 1853 Shopkeeper’s Guide and the 1856 Post Office Directory list Frederick Francis as the ironmonger at number 253, suggesting the demise or retirement of William senior. 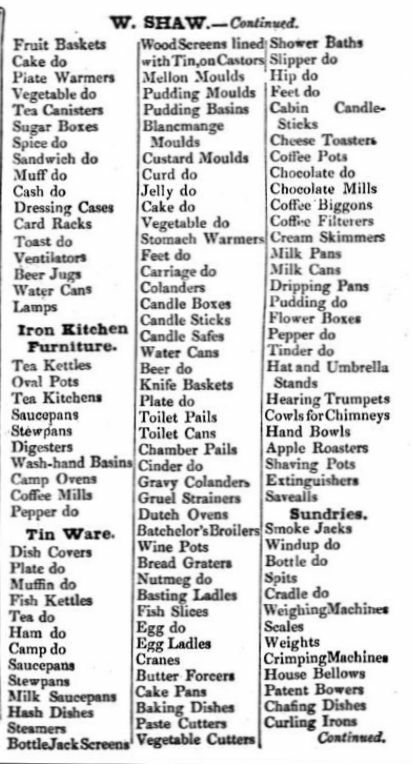 Although the directories keep it simple and just call the gentlemen ‘ironmongers’, they were much more than that. 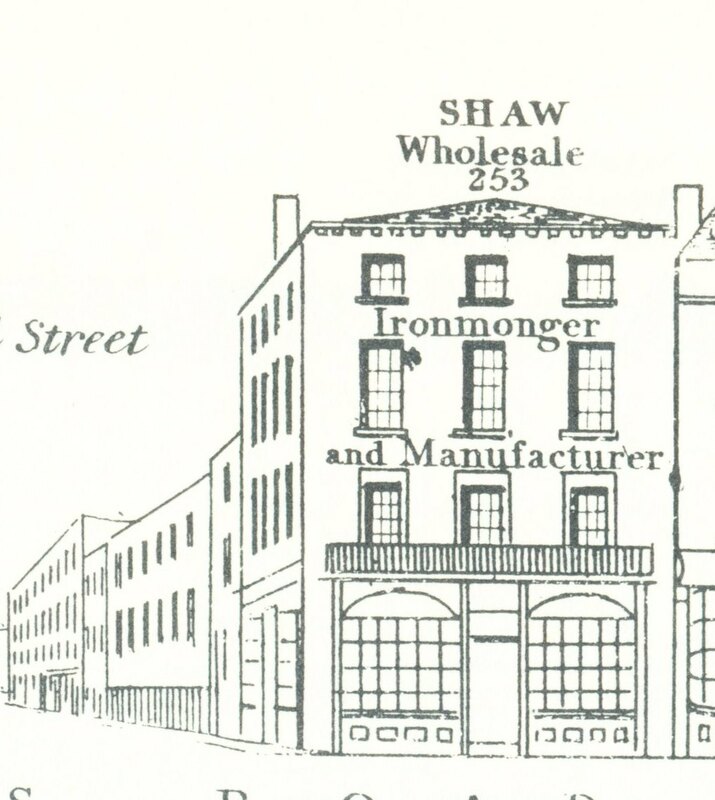 As you can see from the substantial advertisement of four times a third of an oblong page in the Street View (bottom of this post), Shaw was a wholesale ironmonger and stove and range maker. 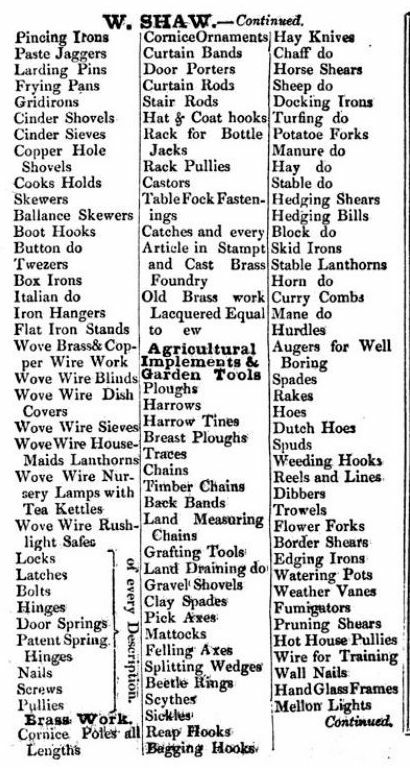 They supplied their customers, be they householders or farmers, with all kinds of metal goods, cutlery, kitchen furniture, garden and other tools, not to mention the ‘sundries’. In other words, whether you needed a teaspoon or a weather vane, a fruit basket or a Dutch oven, a screw or a sickle, Shaw was your man. The records of the London and Birmingham Iron Company seemed to have been a bit of a shambles and one Mr. Harrison who had given Shaw 50l. for 25 shares never received his certificate of shares, but, as he was a friend of Shaw, he saw it more as a loan than an investment. He had been told by Mr. Harris, one of the directors, that he did not have any shares, although his name later appeared in the list of shareholders. 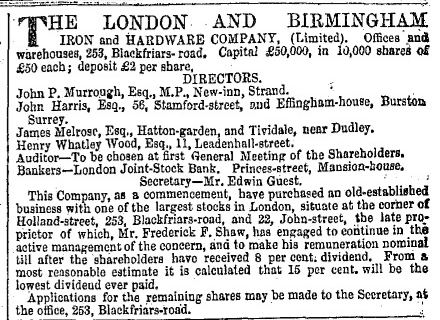 Harrison was not the only one slightly confused about the procedures of the Company; even George Shaw, the brother of Frederick Francis, was listed for more shares than he thought he had. Did the company deliberately fiddle the books, or were they just sloppy in their accounting? The meeting to sort it all out at the Court of Bankruptcy was adjourned, so the report in the newspaper(6) does not give us the final outcome, but the third and final dividend to the shareholders was only made payable in 1896! The shareholders certainly needed a lot of patience with the London and Birmingham Iron and Hardware Company. And Frederick Francis? Well, in 1871 he could be found as a coal merchant in St. Helier, Jersey, and there is a good chance that he was the Frederick Francis who died in the second quarter of 1878 at Lewisham. I cannot prove it, but, at that time, he may have been living with his daughter Emily who was certainly to be found in Lewisham in 1881. 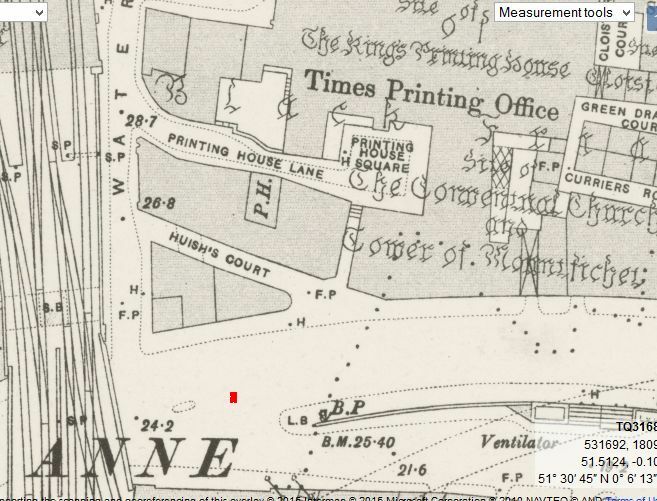 (1) Survey of London: Volume 22, Bankside. Originally published by London County Council, London, 1950. Via British History Online. (2) The Morning Chronicle, 5 May 1823. (3) The Mechanic’s Magazine, Museum, Register, Journal and Gazette, Volume 33, no. 895, 3 October 140, p. 356 (online here). (4) The Era, 15 February 1857; and The London Gazette, 24 February and 27 November 1857. (5) The Jurist, July 1857. (6) Daily News, 26 November 1858. 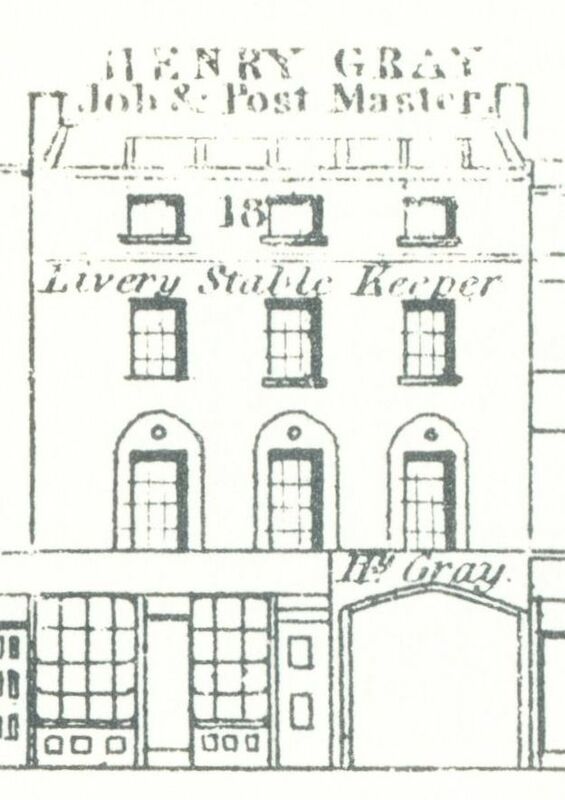 Tallis does not provide a house number for Gray’s establishment, but in the index he is listed between numbers 17 and 18 and Gray himself sometimes refers to his address as number 17½, and so does the 1843 Post Office Directory, so I’ll stick to that. But, as can be seen from the advertisement in the Tallis booklet, Gray had other premises on the opposite side of the Thames, in Earl Street, which was later incorporated into Queen Victoria Street, the newly constructed street to connect Blackfriars to Mansion House. 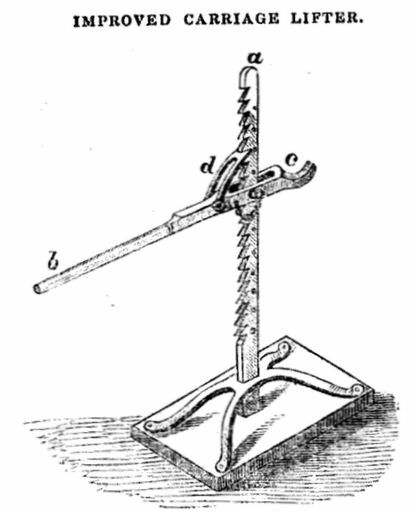 The Register of Arts, and Journal of Patent Inventions, ed. by L. Herbert (1832), plate 8. 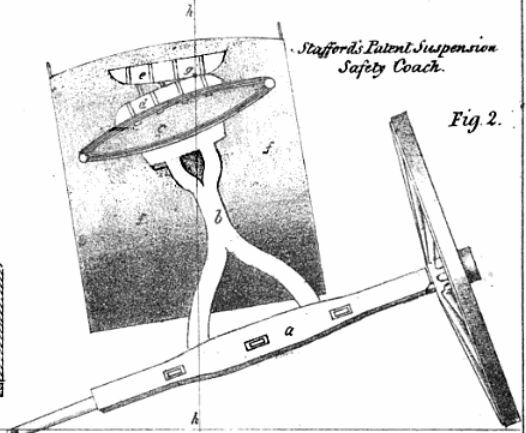 In 1837, The Derby Mercury, quoting The Morning Advertiser reported on a new type of coach, “the new patent safety coach on Stafford’s principle” which was driven by Henry Gray from Earl Street to Palace Yard “at full gallop” while going “through a variety of apparently hazardous evolutions, all of which were performed amidst the applause of the bystanders, with perfect safety”. (3) This new coach had been developed by Daniel Stafford of Liverpool and had its suspension placed a lot higher than in the regular coaches, improving the balance and manoeuvrability with far less chance of it overturning. 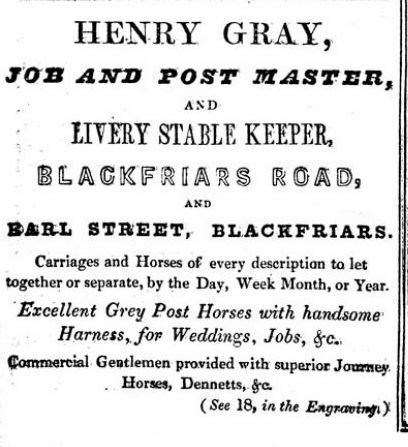 (4) But Gray did not just rent out horses and coaches, he was also a postmaster and as such would have had a nice regular additional income, but for the railways. In 1839, a postmaster, L. Radcliffe, wrote to the Postmasters’ Society, represented by chairman Henry Gray, that the railways had usurped such a large portion of the postal traffic that it caused “a fearful deficiency” in Radcliffe’s finances and he states that “ruin stares the postmasters in the face”. There was an official investigation and Gray was called to give evidence and he explains that the aggregate of the various taxes (one for coaches, one for horses and one for mileage) is so great that many public houses on the railroad where passengers might get off will not be able to keep a chaise or carriage for the convenience of those passengers, but were the taxes moderated, more carriages could be kept and hence there would be no detriment to the state finances from lowering the tax. And his concluding sentence is, “it will be totally impossible to compete with steam-power on the rail-roads, unless the mileage duty is abolished altogether”. The newspaper reporting on the postmasters’ plight quotes Radcliffe’s letter and claimed that customers living some distance away from a railway line were inconvenienced because the railways allegedly “bought coaches off the roads communicating directly with London”, leaving the inhabitants without a cheap and reliable service. The paper makes a case for abolishing the tax on post horses so that the villages along the railway routes were not deprived of the much needed income for public houses, shops, harness-makers and farriers. (5) Yes, progress had its victims I am afraid and in the long run, the post horses and coaches lost the battle. In 1857, Gray made it into the papers once again with a new mode of transport, this time a new omnibus, invented by Thomas Cooke of St. John’s Wood, and built by Gray “The conductor when the vehicle is full in hot weather has only to turn a small handle and the roof is at once raised, giving a rush of fresh air into the interior. Again, if the weather is cold, at the request of the passengers the roof can be lowered in less than a minute by the conductor”. 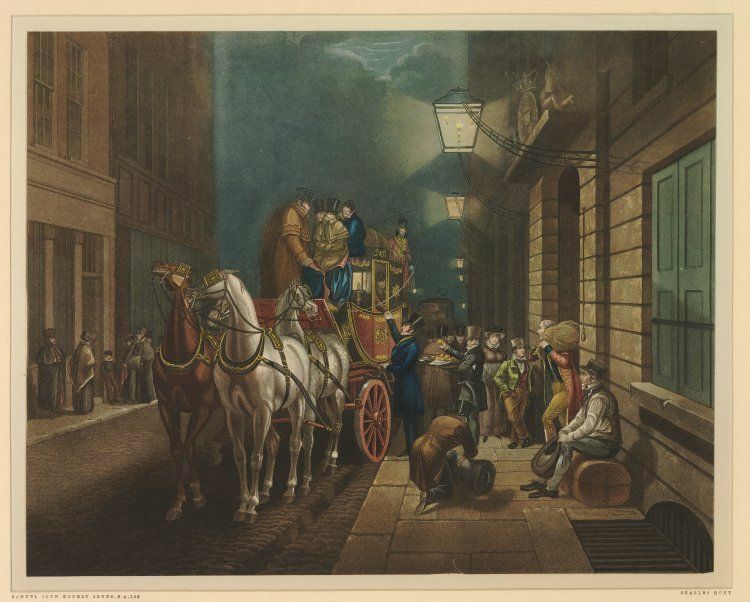 (7) Well, Victorian hygiene being what it was, one with ventilation would certainly be an improvement over the closed omnibuses that had been going round London up till then. 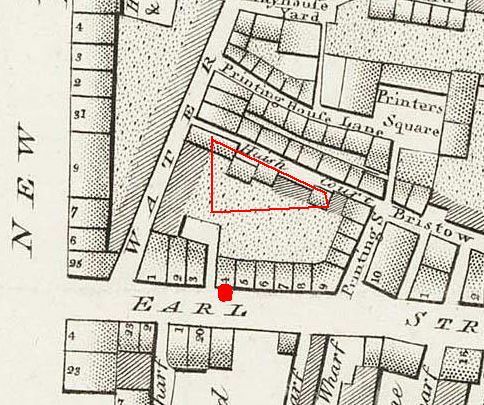 Gray had his stables at 4 Earl Street, but that section of the street disappeared completely when the street was widened and St. Paul’s Railway station (now Blackfriars station) was built. You can see what happened if you compare the 1799 Horwood map to the 1893 Ordnance Survey map below. Only the top left-hand corner of the block in which number 4 was situated remained. In the 1860s, Joseph Bazalgette proposed the new street from Blackfriars to Mansion House and the subsequent widening – read: the disappearance – of Earl Street was part of the Thames Embankment (North Side) Bill. The Report from the Select Committee with the proceedings and minutes of evidence on the change was published in the House of Lords Sessional Papers for 1863. 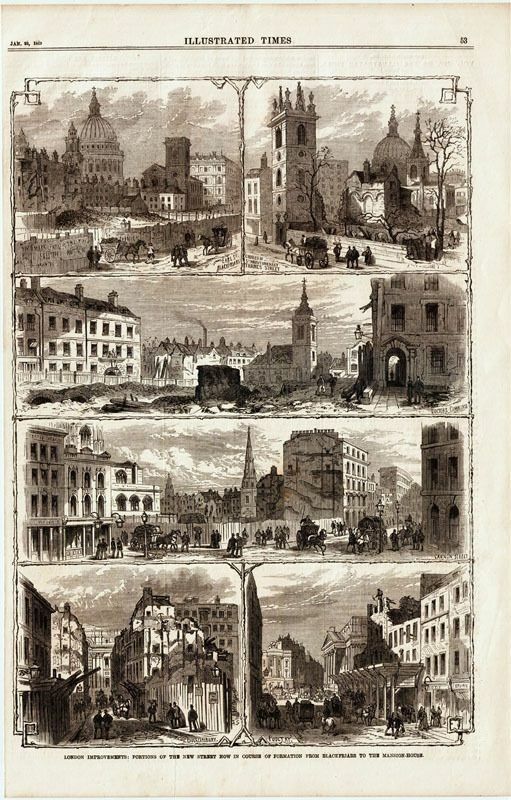 The 1869 Illustrated Times shows the “improvements”. The new St. Paul’s Railway Station and the Blackfriars Railway Bridge were completed in 1883 as part of the expansion of the London, Chatham and Dover Railway. (8) The area had changed completely in 20 years, but what happened to Henry Gray and his business is unclear. Did he get compensated and subsequently retired to the country? I have not found any indication where he went to, so this post ends rather in the air. Sorry about that. (1) Henry (4 November 1796), John (5 April 1798), John (9 February 1800), William (27 June 1802), Susannah (20 October 1805), Charles (19 April 1807), George and Susannah (21 April 1811), and Frederick (23 August 1812). As some of the names are used twice, I presume the earlier child with that name had died and the name got recycled. (2) National Archives, PROB 11/1702/434. (3) The Derby Mercury, 29 November 1837. (4) The London Literary Gazette and Journal of Belles Letters, Arts, Sciences, etc., 1831. (6) Old Bailey case t18470920 in which a forged check was used to pay Gray. (7) The Morning Chronicle, 13 July 1857. (8) Daily News, 30 April 1883.